Well, there's nothing like eating crow after your first video update. I've been on the line with the teams in Bulgaria all morning and it appears the new Q2 2008 release will not be live until tomorrow. 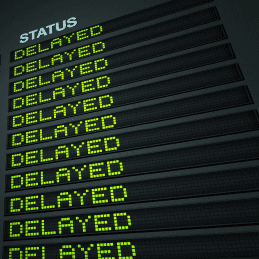 And while a one day delay is nothing compared to the delays some software projects have suffered, we hate to miss announced release targets. As it turns out, there was a last minute problem that our rigorous QA unearthed in the RadControls for WinForms and that is the cause for the delay. All other products- including the new controls for WPF and Silverlight- are ready to go and there is no question that everything will be live on the site tomorrow morning (US time). I apologize to those of you eagerly expecting the release today! While you wait, get a head-start on understanding the new features the RadControls for ASP.NET AJAX by checking-out the already live Q2 2008 online demos. Well, I'd rather wait a little longer nowing that it's for a good cause. Thanks for the heads up and keeping us informed! @Dave- Sorry for the trouble! You should find the new controls in your Client.net account tomorrow morning (if you're in the US). No trouble at all... just eager as always to play with new toys. Thanks for a great site and keeping us informed. @Dave- Good question. This blog is currently run on Google's Blogger platform, so I don't have complete control over the tools (otherwise I'd definitely offer RadGrid). Eventually this blog will find its way to Sitefinity, but until then, we're stuck with Blogger's somewhat limited commenting tools. Thanks for using them! As I am waiting only for ASP.Net Q2, I wonder why everything is delayed for another product. Hey Todd, I am downloading Q2 AJAX controls, but my other ASP.net controls still say Q1 with no download option, I have a full subscription...are the other downloads not ready yet? @Brett- You should see your downloads for all of the new bits now. The license update process takes a few hours, but all updates should be ready now. Enjoy!